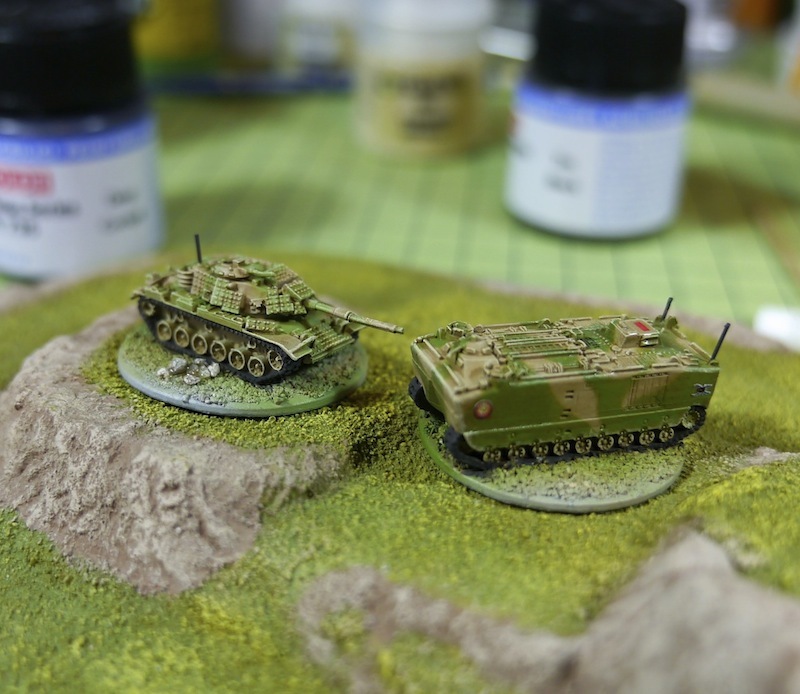 I have been continuing to build a 6mm force with my friend Jonathan Rogers. Jonathan is building a set of Brigade Pacfed Grav tanks, whilst I am using various modern models from GHQ. I now realise how lucky Jonathan is with his grav based army because I have started work on the tracks. These take a lot of time and so far I have only completed half a dozen models with a black base coat. After completing the tracks on about 30 miniatures I will be able to finish off some further weathering, streaking and scratches to the paint work. You can see in the photo below that the addition of the black base coat to the tracks has already greatly increased the sweetness factor of the models. A nice contrast that I don't want to completely lose when I dry brush metal and weather the tracks. My advice and plan for future 6mm tracked models would be to paint the tracks before basing. I usually always base during the early prep process, adding detail, gravel etc and gluing the model down. In fact the metal base means that I can use magnets on stands to help paint and airbrush the model which you can see in the video below, which is a strong reason to base early. However now I reach the track painting stage it is very difficult to get a brush in onto the track, especially where the tracks are resting into the sand base. I do complete the painting on the bases last though and static grass is added after the dull coat. In these models the bases are still not finished and will only be painted in desert colours after the rest of the paintwork and weathering is complete. I am sure it is going to work out well but will take me more time than expected. In this video below you can see the APC's and vehicles with wheels are aslo improved when the wheels are painted. I now wish my entire force had wheels because it would be quicker than painting all the tracks! In this miniature painting tutorial guide video, you can see these models in progress and at the stage where I dry brushed the hulls to bring out the small 6mm details.